This post is part two of a blog regarding valuation issues in divorce cases. The first post focused on standards of value, valuation methods/approaches, and personal vs. enterprise goodwill. As the intersection of business ownership and divorce can get very complex, there are a number of issues that should be considered. This post explores three additional issues that can impact martial dissolution cases. Forensic Issues – There could be an entire textbook written on this subject alone. In fact, there are several textbooks written on this topic. Oftentimes, a forensic accountant will be tasked with attempting to discover fraud in a divorce case. Diverted or hidden income can be commonplace, as money or other assets can be hidden from either spouse. A business owner spouse can use business funds to pay for personal expenses or perquisites in an attempt to make the business look less profitable and lower its valuation. A business owner spouse could also employ other fraudulent accounting techniques such as creating fictitious contractors to funnel money out of the business or inflate expenses through fictitious invoices at year-end. 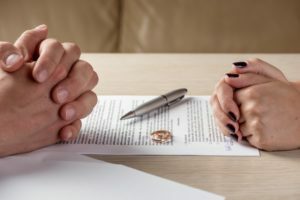 These are just a few of the possibilities among a lengthy list of ways that a business owner spouse that can commit fraud prior to or during a divorce proceeding. It may be advisable for a divorcing spouse to get a forensic accountant on his/her team when a business interest is involved. Asset Tracing – Each state has its own property division rules in marital dissolution. Generally, states classify assets as marital property or separate property. Marital property involves assets that were paid for with marital funds during the marriage. Separate property generally includes assets owned prior to marriage or gifted to one spouse during the marriage. The distinction between these two types of property can be a significant issue. The separate property remains with the owning spouse, which would allow for one spouse to be allocated more than 50% of the couple’s total assets. Documentation is imperative in asset tracing work to prove separate property. Asset tracing can come into play in determining whether cash or investments are separate property even if they are held in a joint account. Additionally, active and passive business interests are often disputed and would require a determination of the classification as separate or marital property. The spouse owning separate property has the burden of proof in these cases. Jensen Claim – A Jensen Claim is named after a divorce case in Texas in the mid-1980s. A Jensen claim revolves around the issue of fair compensation for services rendered to a business by its owner. A spouse must prove that the compensation for time, toil, talent, and effort was not reasonable. The business-owner spouse must have control over the timing and amount of compensation paid, whether it be in the form of salary/bonus, rent, or dividends for a Jensen Claim to be in play. In a Jensen Claim, a business-owner spouse could decide to pay him/herself a smaller salary given the amount of effort expended to grow the value of the business during the marriage. This smaller salary would result in a smaller amount of marital property as smaller paychecks are deposited into the couple’s bank account. If the business owner was not adequately compensated for his/her efforts, the spouse may have a Jensen Claim. Divorce cases can get exceedingly complicated given the magnitude and diversity of the assets involved. In divorce cases involving the ownership of business interests, there are a number of issues that should be examined. DKB’s forensic and valuation services group can help identify and work to resolve these issues alongside litigators to strive for the optimal outcome in marital dissolution cases. Is Lyft really a Unicorn, or a Black Horse leading us to the Next Dot-Com Bubble Burst? Is a Formula the Formula for Success in Buy-Sell Agreements?